As much as we love a good BBQ and summer produce, we’re excited to watch the leaves turn yellow and red and feel the days shorten because that means our meals are starting to change as well. Fall is really our favorite season for cooking. Braises, roasts, Brussels sprouts and squashes... we just can’t get enough. The thing is, most of those autumnal foods require a fair amount of time to prepare. And while there is nothing better than slowly braising a lam neck for 8 hours as you read by the fire, right now we just don't have the time for that. Luckily, we have access to plenty of chicken! 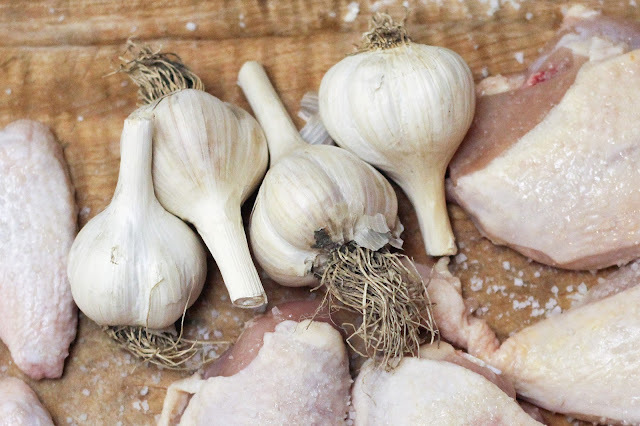 With just a few simple ingredients, chicken lends itself to a quick braise - all that deep, warming flavor we crave within a reasonable weeknight's cook time. For one of our first fall stews Jake brought home a chicken, a quart of stock and 4 heads of garlic while Silka picked up a bottle of dry white wine and some cookies. (Obviously, the cookies were not used in the preparation of the chicken.) In under an hour we were sitting down to a gorgeous meal, in front of a roaring fire and in a warm house filled with the scent of slowly roasted, caramelized garlic. 1. Pat the chicken pieces dry and season liberally with salt. 2. Add oil and butter to a dutch oven over a high flame. 3. 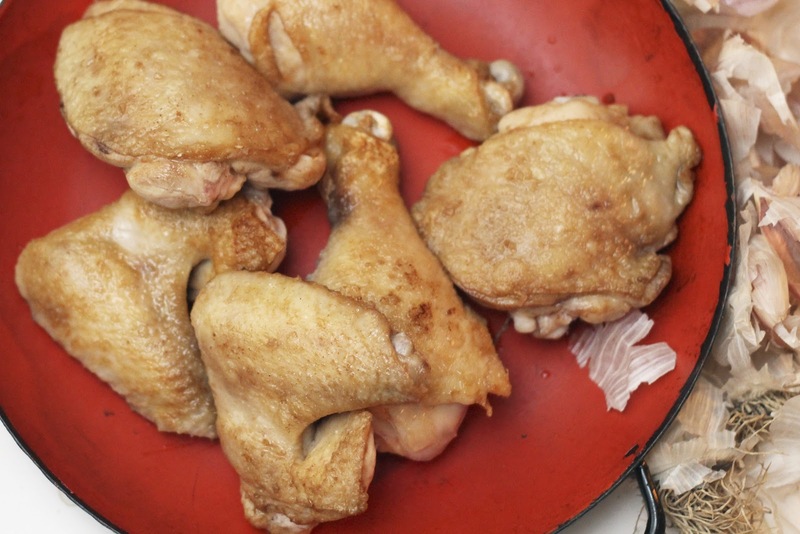 When the fats are hot but not smoking add chicken pieces, skin side down, and cook until skin turns an even, golden brown - about 3 minutes. Turn over to brown other side and when done, set pieces aside. Work in batches to cook all the meat. 4. Reduce heat to medium. 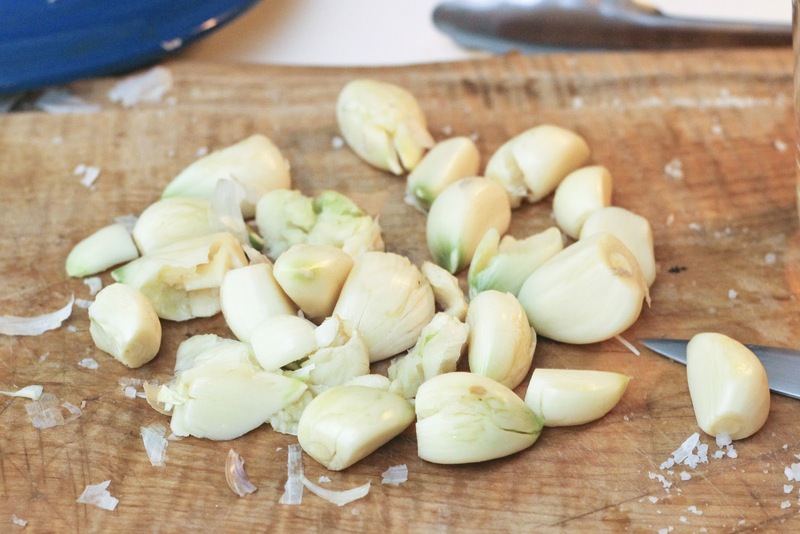 Place the garlic cloves at the bottom of the skillet and sauté until garlic is lightly browned on all sides - about 10 minutes. 5. Add the chicken on top of the garlic then pour in the wine and stock. 6. 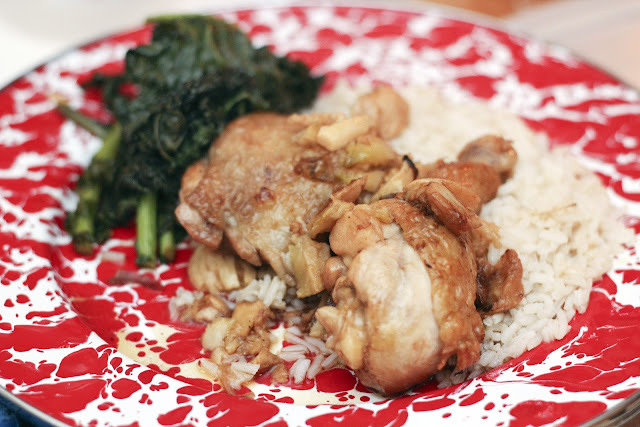 Cover and continue cooking until juices run clear when a thigh is pricked - 10 to 15 minutes more. 7. Take cover off and place under the broiler for 5 minutes to re-crisp skin of the chicken. Serve over rice or potatoes.